Ultra-Shield is a cost-effective, polymer modified sealer with excellent elastomeric properties. It is designed and recommended for use as the membrane component in an exterior wall waterproofing system. Ultra-Shield forms a tough, durable membrane which bridges shrinkage cracks, resists the attack of fungus, mold and bacteria and maintains its superior performance properties when exposed to chemicals found in the soil. The Ultra-Shield waterproofing system ensures a less humid, more comfortable basement. The insulation layer "equalizes" foundation wall and basement air temperatures thereby reducing condensation. In addition, it minimizes potential wall damage due to uncontrolled freeze/thaw cycles. The basement remains leak-free, less humid and more livable. Ultra-Shield can be spray-applied to poured walls immediately after the forms are removed, even at ambient temperatures as low as 20 F. On block surfaces, Ultra-Shield can be applied as soon as the mortar is dry. As a result, construction delays, application time and labor costs are minimized. Ultra-Shield is compatible with a wide range of drainage, protection and insulation boards. The applicator can engineer a waterproofing system "tailored" to your budget, local construction practices and your individual job requirements. Ultra-Shield forms a tough, flexible seal which protects below grade wall surfaces far longer than conventional damp proofing products. It resists mold growth, bacteria and chemical attack, and Ultra-Shield maintains its flexibility and integrity after years of extended exposure to water and soil. A limited 10 year labor and material warranty is available. Typically, a considerable portion of the home's energy bill is required to heat uninsulated basement walls. 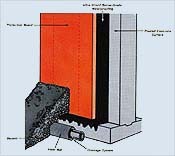 The addition of insulation board to the Ultra-Shield waterproofing system minimizes heat loss through the basement wall and reduces home energy use. The foundation walls and footings must be dry and of sufficient strength and design to ensure structural integrity. Do not apply Ultra-Shield over standing water. Allow the concrete wall or mortar joints to cure a minimum 16 hours before applying Ultra-Shield. Remove dirt, debris, excess mortar, etc. from the footings and foundation walls. Repair all honeycombed concrete or cracks in the walls and footings with non-shrinking grout. In some areas, concrete block surfaces must be parged to produce a suitable surface for the application of Ultra-Shield. Consult your local building official. Repair/fill voids around tie holes, recessed ties, and other small voids with a suitable, solvent-based asphalt mastic. After the wall and footing surfaces have been properly prepared, spray apply Ultra-Shield over the exterior foundation walls and footings. Apply Ultra-Shield at a rate of 20 to 25 sq. ft. per gallon. On unparged block surface, more material and/or additional application passes may be required. Do not apply Ultra-Shield at temperatures below 20 F. To ensure a smooth, successful spray application, heat the material to 120 to 160 F immediately prior to application. Upon completion of spray application, check for any surfaces which were not properly covered. Apply a touch up coat to these areas. In areas where an excessive amount of material was applied, brush out the excess to a thickness no greater than 1/8 inch. Install the insulation, drainage or protection board over the Ultra-Shield membrane within one to three hours after membrane application. Press the material firmly into place. The installation of drain tile and the backfilling operation may proceed immediately after the installation of the insulation board. Do not leave the sealer unprotected for more than 15 days. Long term exposure to sunlight may impair the sealer's performance properties. Drain tile must be installed per the manufacturer's recommendations to ensure proper removal of water from the foundation walls and footings. Backfill must be graded to direct surface water away from the exterior foundation walls. Ultra-Shield should be applied to smooth, properly prepared concrete wall surfaces. No priming is required. Ultra-Shield is designed for quick, economical spray applications. Concrete wall surface after treatment with Ultra-Shield membrane. Ultra-Shield is compatible with a wide range of insulation, drainage or protection boards. The applicator can "tailor" a waterproofing system to your job or budget requirements.